Author nalterPosted on June 16, 2009 Categories health, history2 Comments on It's Homeopathic Awareness Week! ten with 100 zeroes. (Why does wikipedia print it with 145 zeroes? Looks like someone got away with it!) The correct name would be ten duotrigintillion, which sounds cooler anyway. So why is the search engine google.com instead of googol.com? Sean and Larry [google.com founders] were in their office, using the whiteboard, trying to think up a good name – something that related to the indexing of an immense amount of data. Sean verbally suggested the word “googolplex,” [1 with googol zeroes] and Larry responded verbally with the shortened form, “googol” (both words refer to specific large numbers). Sean was seated at his computer terminal, so he executed a search of the Internet registry to see if the newly suggested name was still available for use. Sean is not an infallible speller, and he made the mistake of searching for the name spelled as “google.com,” which he found to be available. Larry liked the name, and within hours he took the step of registering the name “google.com” for himself and Sergey. Whoever owns googol.com is probably hoping google with give them googol dollars for it. We went to the Nuclear Science and History Museum which opened in its new location near our house this weekend. It’s pretty large now, with a lot of exhibits. One annoying thing was a loud water electrolysis exhibit that separated hydrogen from water and used it to fire a ping pong ball high into the air. It was like a gunshot going off every few minutes. Hopefully, they’ll move that one outside. It looks like they’ve still got to assemble some large stuff in the back lot. Lots of unlabeled airplane and rocket parts sitting out there. Anyway, I learned that people have been weird about radiation. They’ve been scared where they don’t need to be and casual where they should have been scared. The nuke stuff was pretty insane. In the 60s, there was even a small nuke that could be carried by 3 soldiers and launched 1000 feet away. Sounds like a really bad idea. In 1966, an air collision between US planes in Spain caused the accidental dropping of 4 nukes. There was no nuclear explosion, but one of them broke up and dumped some plutonium. There was an x-ray machine just to make sure your shoes fit you in the shoe store in the 30s and 40s. Yikes. All kinds of quack radiation treatments involving radium. But then the museum had to have large exhibits just to point out that nuclear power is pretty safe if done correctly, since people in the US are deathly afraid of that. 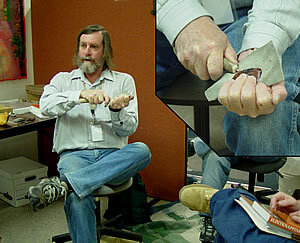 We went to the library Saturday and saw a demonstration of flint knapping. novelty surgery where sponges are direct from the sea, lobster claws are the clamps, and the anesthesia is grog. Arrrr! The original Hansel and Gretel story was kinda gruesome. Aside from the point that the witch wanted to eat the children, the childrens’ parents abandoned them in the woods in the first place, because they couldn’t feed them anymore. They don’t make kids’ stories like they used to. Apparently, child abandonment like this was not unknown during the middle ages. Anyway, there are often three phases of revision in old kid stories. The original is kinda unpleasant. Then, Brothers Grimm would make a gentler, more kid-friendly version of it. And then Disney would Disney-ize it even further. Ethan lent me his Jack Benny DVDs. Jack Benny had a comedy show in the 40s. It was heavily sponsored/produced by Lucky Strike cigarettes. The opening title even says, “The Lucky Strike Show, starring Jack Benny”. I guess it would be like “The Jello Pudding Pop show, starring Bill Cosby”. Anyway, it’s odd to see TV commercials talking about all the virtues of their cigarettes without a care in the world. The basis of one of the skits is Jack trying to renew his contract with the American Tobacco Company. A friend pointed out that the US military included cigarettes in soldiers’ rations during World War II. That’s a bit like the rum that the British Royal Navy gave sailors in the 1700s as their main drink. My uncle pointed to a page about the Alter automobile. Dunno if this Clarence Alter was related to the family. In Britain, they have a custom of Christmas crackers. These things have a tiny firework snap when you pull them apart. They have a cheap little cracker-jack-style prize in them. Two people pull them apart and whoever pulls the prize part gets to keep it. Opening Saturday at the New Mexico Museum of Natural History and Science is STARTUP…an exhibition about the history of the computer. It’s funded by Paul Allen, a founder of Microsoft. Bill Gates (also of Microsoft fame) has an investment company called Cascade investment that is going into a 50-50 joint energy venture with PNM. Microsoft started in Albuquerque, so it’s interesting to see the Microsoft boys interested in New Mexico again in some way. In medieval England, many people couldn’t read or write. How did they get the news out? The town crier walked around with a bell, yelling out the news.